One of these programs will be a production of David Belke’s The Maltese Bodkin to be performed by The St. John’s Players. The theater group wanted to pick something rather unique that still fits into the spirit of the festival. One reason why the St. John’s Players ended up going with Belke’s story was because they found out that we were going to be performing on April 23rd, William Shakespeare’s birthday. “That kind of cemented it for us so we she felt like a good fit for the festival.” said Hibbs. With a cast of 18 performers and 23 with background actors, everyone involved feels this is the perfect showcase for those who appreciate the works of the Bard. 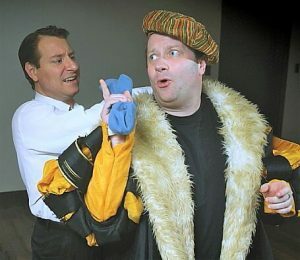 And indeed, various characters from many of Shakespeare’s works are used to fill the roles within this story. “Imagine all of Shakespeare’s characters living in a community as they would come and go, as they would be in their plays.” explains Halliday. The story, combined with the play’s costumes, props (swordfights!) 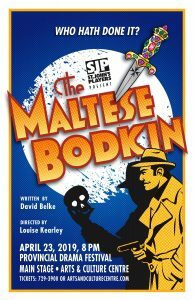 and even with the music chosen (a ‘40s noir saxophone meets with a Shakespearean era lute), the team behind this production of The Maltese Bodkin promises audiences will have a good time.